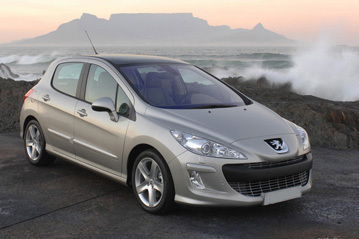 Peugeot asked for the 308 to be re-assessed against Euro NCAP's 2009 requirements. The driver knee airbag fitted to the test car in 2007 no longer qualifies for assessment, as it is not expected to be sold as standard equipment in sufficient numbers. Therefore, Euro NCAP has performed a repeat frontal impact test, and has carried out its new whiplash assessment to give a star rating for 2009. In the frontal impact, the passenger compartment remained stable. Dummy readings indicated good protection for the knees and femurs of both the driver and passenger. Peugeot showed that a similar level of protection was available to occupants of different sizes and to those sat in different seating positions. In the side barrier test, the car scored maximum points, providing good protection to all body areas. In the more severe side pole test, dummy readings of rib deflection indicated poor protection of the chest. The seat and head restraint provided marginal protection against whiplash injury in a rear impact. In the frontal impact, forward movement of the head of the 3 year dummy was not excessive (the 18 month was sat in a rearward facing restraint). In the side impact test, both dummies were properly contained by the protective shells of their restraints. The passenger's airbag can be disabled by means of a switch. However, information presented to the driver regarding the status of the airbag was not sufficently clear. The label warning of the dangers of using a rearward facing child seat in that seating position without first disabling the airbag is not available in all European languages and was not rewarded. The bumper scored maximum points for its protection of pedestrians' legs. Also, the protection offered by the bonnet to the head of a struck child was predominantly fair. However, protection of adults' heads was mostly poor. Electronic stability control is not standard on all variants of the Peugeot 308. However, it is fitted as standard equipment in the majority of cars sold, so qualifies for points under Euro NCAP's assessment. Similarly, a driver set speed limitation device is optional equipment, but widely fitted as standard. A seatbelt reminder is standard equipment for the driver and front passenger seats. A system is available as an option for the rear seats but is not sold widely enough to qualify for assessment by Euro NCAP.